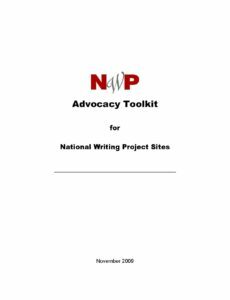 Summary: The NWP Advocacy Toolkit was developed to help NWP site leaders gain local, state, and national support for their sites, and to provide information about the federal legislative process. This toolkit is a valuable resource for sites in their ongoing efforts to educate policymakers about the importance of writing and of the writing project. The toolkit offers tips for making appointments with legislators, writing letters and emails, and building relationships. It also provides background information about the legislative process, a listing of relevant Congressional committees, a glossary of legislative terms, and tips on using the media to promote local site efforts. 1. Always schedule an appointment in advance. Time is valuable in legislative offices. Contact the office in advance to arrange a meeting—do not drop by and expect to meet with someone. It is best to email your meeting request and to follow up with a phone call and fax. Due to legislators’ busy schedules, meetings are often reassigned to staff. 2. Prepare thoroughly for your meeting. Do your homework before meeting with your legislators. Visit their websites to find out about their policy interests and voting records. Particularly, find out how they have voted in the past on your issues, be aware of their party leadership’s stance on the issues, and know committee assignments.